Well, how do I say it. I caved in to temptation. Canon announced a new rebel dSLR camera at the end of March. It has video! I have been waiting and thinking about this camera, the EOS Rebel T1i. It was delivered to the stores on Thursday; I held out until 4:00PM on Saturday. Rick went with me to buy it. I have only had a day to play with it. I haven’t moved past the auto setting, but as you can see from this little bit of sock knitting I finally have depth of field. It also snaps pictures fast, just like Austin Powers. It is another technology to learn. We went out to a park and the brim of my hat caused the flash to go off when I looked through the view finder. It isn’t as simple as turning off the flash on a point and shoot camera. So I have still lots to learn. Also I just noticed the proportions of the photo it takes is different from the point and shoot ones. I guess each camera uses a different shape of rectangle. I never realized that before. 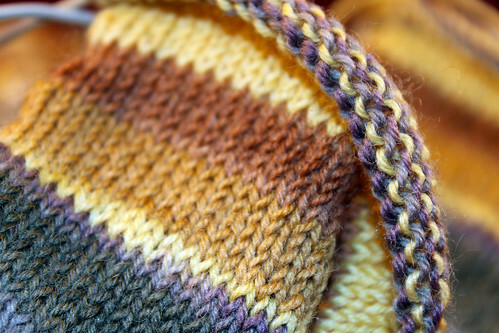 This entry was posted on Monday, April 27th, 2009 at 3:00 am and is filed under Knitting and Photography. Tagged: Knitting, Photo. You can feed this entry. You can leave a response, or trackback from your own site.